Raising a stink: The spade-shaped brown marmorated stink bug (Halyomorpha halys). Photo courtesy of the United States Department of Agriculture (USDA) Animal and Plant Health Inspection Service (APHIS). 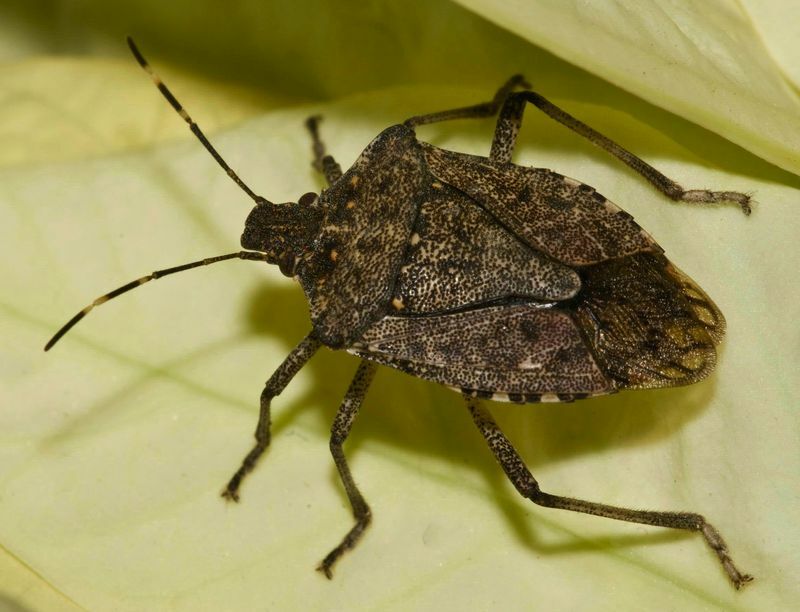 It’s no secret that stink bugs have voracious appetites that leave boreholes in everything from tomatoes, peppers and soybeans to apples, peaches and grapes. But as Editor-at-Large Therese Ciesinski explains, the smelly little insects also have a taste for home, turning up inside when the weather turns chilly. Fall brings a chill that puts many of us in a nesting frame of mind, when we turn indoors to the warmth and comfort of our homes. Insects, too, seek out shelter in our private spaces. And for many, stink bugs are the ultimate uninvited guests. But Allentown is renown. (See? Try that with Bethlehem.) It’s the stink bug capital of the U.S. In 1998, when brown marmorated stink bugs journeyed from the Far East to the New World, Allentown served as Plymouth Rock. The bugs’ arrival was unintentional, but upon finding the continent pretty tasty, they stayed. Stink bugs eat by sucking the juices out of fruits and vegetables and since few natural predators enjoy doing to same to stink bugs, their numbers are increasing. It’s taken just 15 years for the bugs to spread into 39 states.That’s impressive mileage for an insect that can’t fly in a straight line, smashes into walls, and spends most of its life on its back, trying to roll over. The USDA considers the brown marmorated stink bug an invasive agricultural pest, and scientists are studying how to control them. Gardeners, farmers and scientists would probably be the only ones giving a darn, if the bugs just stayed outside. But in the fall, when the temperatures drop, stink bugs meander into the homes of John Q. Public. Usually it’s only a few dozen, but in some places numbers reach biblical proportions. But they’re not looking to raid your veggies; the bugs just want a warm, quiet place to hibernate over winter. Most seek out wall voids and window ledges, but a few lose their bearings and I’ve found them in coat pockets and the fridge. Once, after hitting the print button on my computer, I watched one emerge along with the document. Stink bugs look fierce, but they’re harmless. They don’t bite or sting. They don’t have to. Because when you can stink, you don’t need no stinkin’ stinger. More than their sheer numbers that show up, it’s the odor that people object to. When disturbed, a stink bug emits from its thorax a chemical cocktail that’s insect for “Back off, Jack.” While some gardeners say the scent is similar to that of a skunk, one entomologist described the smell to me as “cilantro-like.” Okay, so even if, as nose-wrinkling odors go, it’s less objectionable than what the dog or cat gets blamed for—or it smells like Chanel No. 5—if it’s coming out of a bug’s abdomen, I’ll pass. How to keep stink bugs out of a house? Caulk every hole (good luck with that). How to get rid of them once they’re in? A vacuum cleaner is effective (remember to banish it to the garage until the odor goes away). Skip pesticide sprays and foggers, they’ll kill the bugs you can see, but won’t get the ones sleeping in the walls. Or the printer. This entry was posted in Garden Pests, Uncategorized and tagged garden pests, invasive insects, stink bug, stink bugs. Bookmark the permalink. Allentown’s new tourist slogan, “Come to Allentown: the stink bugs’ Plymouth Rock!” Great article! I leave my kitchen light on all night from fall till spring as a light trap and by may it is full. I find that my spiders eat as many as they can and that mice will clean up the dead ones!! Enjoyed the style, here, if not the topic. You’ve made a real problem nearly funny–Thanks!